To contact APPCN regarding member program webpage updates please email APPCN Secretary Brenna McDonald, PsyD (mcdonalb@iupui.edu). For questions about membership dues, please contact APPCN Treasurer, Suzanne Penna, PhD (spenna@emory.edu). APPCN dues for 2019 are now due. If your program has not paid, please do so immediately. Thank you. 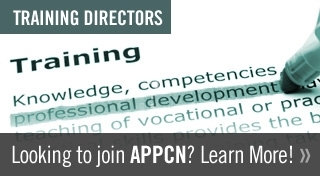 APPCN welcomes applications at any time from programs pursuing membership in APPCN, though to be eligible for the February Match, applications must be submitted by November 1 of the prior year. Please click "Become a Member" here or above. There are a number of benefits for programs joining the Association of Postdoctoral Programs in Clinical Neuropsychology. Programs interested in joining APPCN, please follow this link. If you have more questions, please click "CONTACT US" below. Individuals interested in applying for a postdoctoral position in Clinical Neuropsychology, please see our Member Programs page. Having trouble viewing this website? Please make sure your computer is updated to the most recent Internet Browser that you are using.